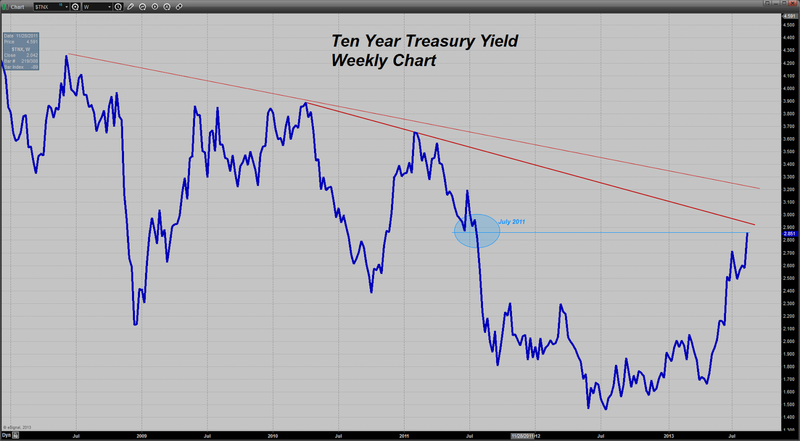 There is no doubt in my mind that we have seen the lows in yields for Treasuries perhaps for the rest of my lifetime. 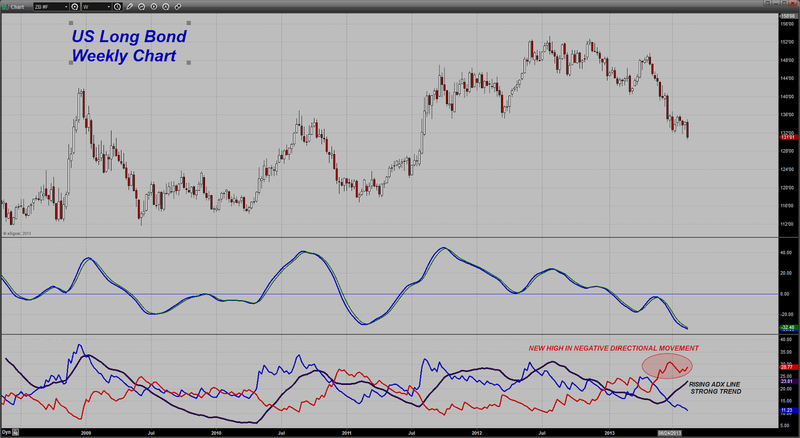 The long bond has topped out on its price chart indicating an end to the THREE DECADE LONG bull market in bonds. 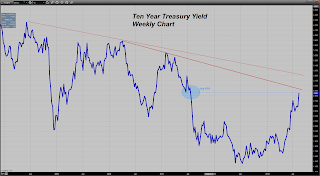 While that does not mean we cannot get some intervals during which interest rates move lower again, I do not expect to see the long bond to ever again exceed the top shown on this chart. If it were, it would signify a PROLONGED DEPRESSION the likes of which would be difficult to envision. The weekly chart is also showing a rising ADX line indicating the start of a trending move, in this case to the downside. I find this rather interesting because I believe that the Fed does not want rising long term interest rates. For whatever reason, the chart is showing that the bond market is expecting the exact opposite. Already today the Ten Year hit a TWO YEAR HIGH yield of 2.864% at one point before settling the day at 2.829%. Think about this - it was just 14 basis points shy of hitting 3% today! I wonder how that is going to play with the real estate/housing markets? There is obviously rotation going on with money moving out of bonds but whether or not the majority of that is going into equities is a bit unclear to me. It sure seems like some of it is heading back into the base metals/precious metals and certainly the mining shares right now. 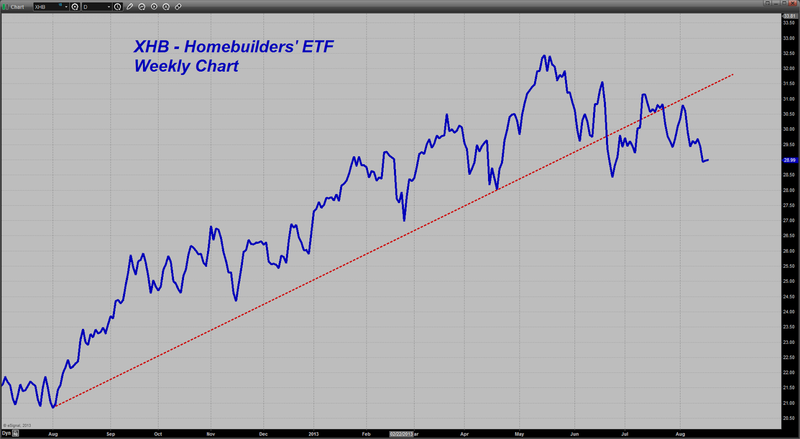 One thing is clear - it sure ain't going into the home building stocks! 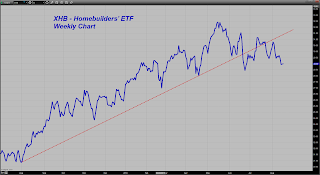 Also, check out the home builders ETF, XHB, and look at the break in the uptrend. It sure seems to me like the Street is noticing this rise in interest rates and is treating the homebuilders accordingly with an expected negative impact to the industry. If the Street sees it, my guess is that the Fed is also seeing this and is not happy! I do not care what anyone says including Mark. What I know to date is that the housing market has been "revived" barely and is on life support. 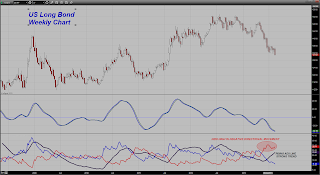 The chatter on MW today was a desperate attempt to call attention to the builders for buy. They said the builders are building apartments. Wow, isn't that happy times. The new USA. Live to rent. Sad. Also, I was working for a Regional for a year, they had limited interest in lending $ to small entities. Anything less than $50MM annual revenue type operations was like no loanie. Prior to the invent of Odeath care, these type of operations used to create lots of entrepreneurial growth positions and EMPLOYMENT but were now considered HIGH RISK. Pitiful for mom and pops as they are not $50MM+ annual revenue type entities. The Banks were, however, so proud of stuffing their deposit accounts with cash and cross collateralizing everything. They also were so proud of running game on anyone they could to get their investment accounts. No investment or cash deposit, no loan. Was that not sweet of them? I am going to work for an independent finance company and will be selling against the banks. Should they maintain their previous targets markets, and their go to market strategy (tie their hands behind their backs)I feel it will be an OPPORTUNITY!!! Maybe even be able to make some loans. I hope Jim is wrong about the inevitable Cyprus program coming to the US of A. I also hope he is wrong about the potential for the future Corzination of the Banking Investment world. I heard today that Merrill was going to be folded into the Bank footprint. If I was a Merrill client, I would be very careful not to get a loan from BAC, who knows what is in that document that ties them to the Investment and Deposit accounts that previously were in a separate company. Take care Dan. Interesting times to come. White Wolf; You are right about the whole system being broken and rigged. December of "09 should have been the top in bonds, but alas, they were able to massage things for 3+ years, until finally, reality began setting in this year. Very perilous times. Sorry White Wolf; Meant December of "08 on the bond! Yes I am but saddened not only for myself but mostly for the whole financial system. I was part of the risk side in the GE Capital machine when they copied the securitization structure of the residential mortgages. I had a superior who understood much more than I at the time. I remember his words well that organic portfolio growth was a better way to go. It appears we are now in the end stages of what I term "The Game". Others can call it the End Game. I find it really sad that the once powerful Fed is now shameless and their professionalism so dwarfed. The epitome of emptiness of character. Lets see how bad the game goes on. Dimon, Corzine, Paulson, Geitner, all empty inside I would think. Do they really believe they are doing what is best for the people at this point? Or are they such deceitful individuals that they are lying to themselves when they say what they say? I guess we will soon find out.